Last week’s ragù di tonno didn’t go down too well. I was even told off for applying the word “ragù” to fish. So this time something classic, that will hopefully keep the purists happy. What’s more, this dish for me is a benchmark. When I try a new fish restaurant, I will always try to order it, even if it’s not on the menu. Just as when I try a new bar, I ask the barman for a dry martini (stirred, not shaken, please, despite James Bond’s views on the subject). My reasoning is that the classics are the easiest to produce at an acceptable level (not least, because everyone knows how to make them), but the hardest to excel in (partly for the same reason, but also because it is here that the attention to detail really makes the difference). This is why they’re perfect for sorting out the good from the great. “hard” molluscs (i.e. shellfish): mussels, clams etc. crustaceans: prawns, lobster, spiny lobster, scampi, slipper lobster etc. classic “soup” fish: scorpionfish, monkfish, grouper, weever etc. Fish stock. The basis of any good soup is a good stock, and fish soup is no exception. You can buy ready-made fish stock, you can buy fish stock concentrate. You could just use vegetable stock. But why not make your own? Just put the heads, shells and bones of any crustaceans/fish you are using together with a bunch of parsley, a carrot, halved onion and a couple of sticks of celery in a saucepan. With a wooden spoon, squash the prawn heads to extract as much flavour as possible. Add about a litre and a half of water, cover the pan and bring to the boil. Then simmer for about forty minutes. Filter through a sieve and season to taste. This is actually a very straightforward recipe, especially if you can get your fishmonger to do some of the hard work for you. Another crucial detail is the short cooking of the fish, which ensures not only tender flesh, but means that the various ingredients retain their individual flavours. The saffron is an optional. I always include it, and I like the colour and extra aroma it gives. Yesterday I forgot, but the soup still tasted good. So what the hell; try it either way. Clean the fish. In other words, peel the prawns, wash the clams and discard any that are open and don’t close after a light tap. Slice the squid into rings. 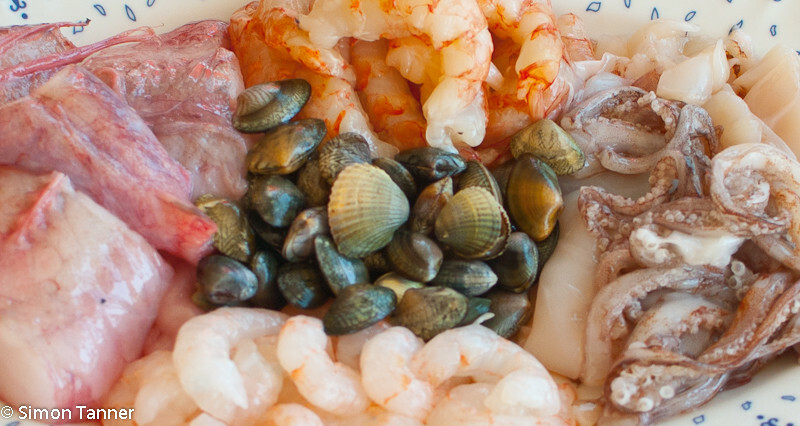 Gut the fish if your fishmonger hasn’t done it for you. Descale any fish that require it. If you have any large fish, you could fillet them and cut into chunks. Leave small fish whole. If you’re making your own fish stock, throw the prawn heads and any discarded fish heads/bones into the stock pan. Prepare the crostini. 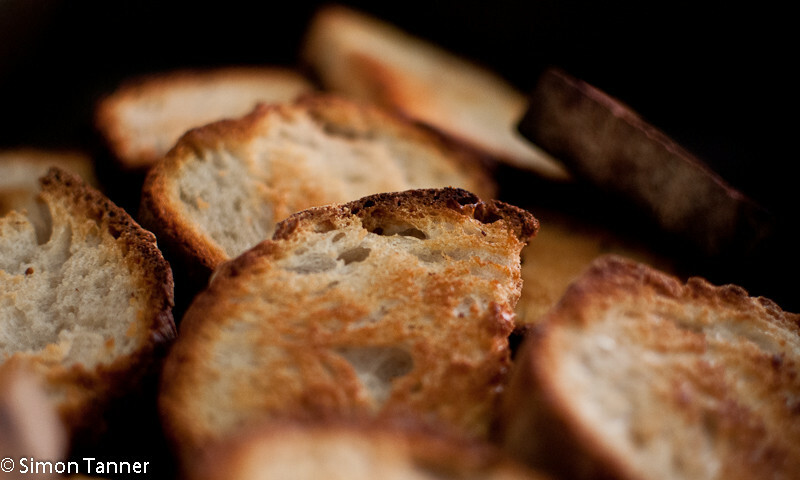 You want dense bread that can handle a lot of liquid, not something that’s going to dissolve, so sourdough is perfect. Slice into 1.5 cm slices and then toast, grill, or brush with oil and bake in the oven. Just do whatever it takes. In a saucepan, gently sweat the onion in a little olive oil for five minutes, then add the garlic and thyme, and continue to cook over a low heat for a further two minutes. Add the tomatoes, tomato purée and fish stock. Simmer, covered for 15 minutes. Add the saffron if using, and all the fish except for the clams. Bring to the boil and cook for a couple of minutes. Add the clams and continue cooking until they have all opened (a minute or two should be enough). 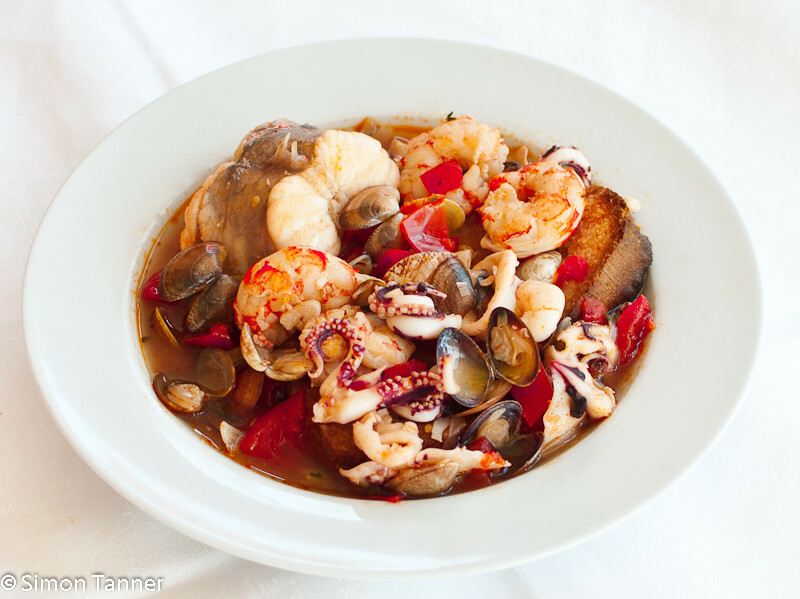 This entry was posted in Fish, Recipes and tagged fish, seafood, soup by hungryenglishman. Bookmark the permalink. A very fine recipe except for one thing. Adding the clams to the broth two or three minutes after all other fish has been added guarantees that the fish will be well overcooked. The clams should be added first because they take the longest to cook.